This is the second part of my discussion of Richard Wilkinson and Kate Pickett's The Spirit Level. In part 1 (and the updates parts 1.5 and 1.75) I covered their use of international comparison data and the limited consideration they give to potentially confounding factors such as material differences between high and low equality countries and their arbitrary and suspect looking decisions to exclude various countries or measures that upset their arguments. I'll reiterate at this point that I'm all for reducing income inequality (as well as other forms of inequality), I think it is responsible for a number of pernicious and harmful effects in our society. However, I think the specific take on this problem by Wilkinson & Pickett (W&P) is both objectively unproven (and speculative) and potentially counterproductive. The neo-material interpretation says that health inequalities result from the differential accumulation of exposures and experiences that have their sources in the material world. Under a neo-material interpretation, the effect of income inequality on health reflects a combination of negative exposures and lack of resources held by individuals, along with systematic underinvestment across a wide range of human, physical, health, and social infrastructure. An unequal income distribution is one result of historical, cultural, and political-economic processes. These processes influence the private resources available to individuals and shape the nature of public infrastructure—education, health services, transportation, environmental controls, availability of food, quality of housing, occupational health regulations—that form the “neo-material” matrix of contemporary life. This leads me to object to the core thesis of the Spirit Level - Wilkinson & Pickett go to great pains to claim that far from it being life's material inequalities that underlie the detrimental effects of income inequality in richer societies, it is in fact the psychological impact of this inequality that causes all the problems. Indeed they claim that material inequalities actually have no effect on health or other outcomes! We saw a little of this in part 1 where I discussed W&P's argument that expenditure on health in rich countries actually has no effect at all on life expectancy, infant mortality, or other commonly used measures of health outcome. Although it is a little more vague and spread out in the book, in their interviews for the radio (e.g. Pickett on More or Less, or W&P on Analysis) W&P make it very clear that they are proposing a rather bold version of 'status anxiety' such that the stress of an unequal society directly causes ill effects via the physical consequences of stress hormones on health. I should be upfront and say that this is far from biologically implausible, we know that chronic stress affects the hypothalamo-pituitary-adrenal axis and can therefore alter hormone levels, and we know high levels of the 'stress hormone' cortisol have been associated with increased cardiovascular (but not other) mortality**. But what is so appealing about the psychosocial hypothesis over the neo-materialist explanation for the relationship between income inequality, health, and other bad stuff? As societies have become richer...so the diseases we suffer from and the most important causes of health and illness have changed...During the greater part of the twentieth century, the predominant approach to improving the health of populations was through 'lifestyle choices' and 'risk factors' to prevent these chronic conditions. Smoking, high-fat diets, exercise and alcohol were the focus of attention. But in the later part of the twentieth century, researchers began to make some surprising discoveries about the determinants of health. They had started to believe that stress was a cause of chronic disease, particularly heart disease. Heart disease was then thought of as the executive's disease, caused by the excess stress experienced by businessmen in responsible positions. The Whitehall I Study, a long-term follow-up study of make civil servants...expected to find the highest risk of heart disease among men in the highest status jobs; instead, they found a strong inverse association between position in the civil service hierachy and death rates...Further studies...in Whitehall II, which included women, have shown that low job status is not only related to a higher risk of heart disease: it is also related to some cancers, chronic lung disease, gastrointestinal disease, depression, suicide, sickness absence from work, back pain and self-reported health. So was it low status itself that was causing worse health, or could these relationships be explained by differences in lifestyle between civil servants in different grades?..these risk factors explained only one-third of their increased risk of death from heart disease. And of course factors such as absolute poverty and unemployment cannot explain the findings because everybody in these studies was in paid employment. Of all the factors that the Whitehall researchers have studied over the years, job stress and people's sense of control over their work seem to make the most difference. Ah, the Whitehall II study - it all comes down to this. 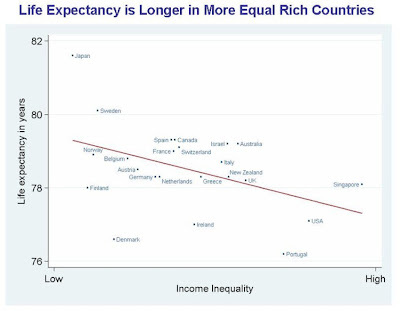 It is important for W&P to point towards studies like this because, for all their emphasis on comparing countries, because there are so many confounding factors comparing a few dozen heterogeneous countries, no one is going to believe that there is an association between inequality and health unless it can be shown at the individual level within a society. Now the Whitehall II study is something I've covered before, but I think it is clear that my observations merit repetition in the context of the argument over the Spirit Level. As W&P say, the Whitehall II built on the findings of the Whitehall I study to show that employment grade and health outcomes, in particular coronary heart disease (CHD), are associated***. While risk factors such as smoking do account for a lot of this association it has been claimed that the strongest predictor of CHD incidence, even taking risk factors into account, is 'low control at work'. Job control is supposedly associated with CHD independent of job grade (and so presumably socioeconomic status), leading to the conclusion that low job grade is associated with heart disease because low job grade is associated with low job control - that is, it is the psychosocial strains of being in a low grade job that cause CHD. It would be difficult to overstate just how influential this conclusion from the Whitehall II data has been - although there have been other studies in other populations and looking at other psychosocial factors this is the core of the evidence for the role of psychosocial factors in causing disease. So just what constitutes coronary heart disease? The question I want to ask is how robust is this association between CHD and job control? There have been a number of studies looking at the Whitehall II data and job control (e.g. Bosma et al 1997, Kuper & Marmot 2003) and all have found the same thing - low job control is associated with higher incidence of CHD whatever job grade you are in. But all is not quite as it seems - coronary heart disease (CHD) is quite a broad term, it covers a spectrum from fatal myocardial infarction (MI) to cardiac chest pain (angina), but all of these are the result of ischaemia in the heart. Most studies of the Whitehall II data have tended to lump all CHD together, combining MIs with angina to create the broad category of CHD. If we look at the findings from these studies we can see something very interesting, once we take into account confounding factors (like age or health related behaviours such as smoking) the association between CHD and job control is driven by angina rather than MI. So in the paper by Kuper & Marmot they looked at two outcomes, all coronary heart disease and myocardial infarction (fatal or non-fatal). They actually found no effect of job control for women, but for men there was a highly significant effect of job control on all CHD even adjusted for coronary risk factors (smoking, cholesterol, hypertension, exercise, alcohol, BMI). However, there was no effect of job control on the rate of MI. And there wasn't even a relationship when the comparison was unadjusted for coronary risk factors. This is a puzzling result - if job control causes CHD then we would expect this to be reflected in all forms of CHD, in rates of MI just as much as angina since it is the same underlying biological process (furring up of the coronary vessels in the heart) that underlies both angina and MI. Since the majority of patients classified as having CHD in the Whitehall II studies had Rose questionnaire diagnosed angina it is these patients driving the association between job control and CHD - those patients with harder end-points, actually having an MI or having a doctor diagnose them with CHD, didn't seem to show this relationship. So why might that be? The Rose angina questionnaire used in the Whitehall II study is a self reported measure of chest pain. All studies that have looked at the association between psychosocial factors and CHD in the Whitehall II data have classified anyone with a positive angina questionnaire as having angina and thus having CHD. The use of this questionnaire reminds me of a (possibly apocryphal) study I heard about where they gave healthy people a checklist of life threatening symptoms (chest pain etc) and asked them to keep a diary for a few days recording them - at the end of the study everyone had recorded 1 or 2 potentially life threatening symptoms per day. So most studies have tended to find associations only between subjective reports of psychosocial factors (such as job control but similar problems are found in studies of other 'psychosocial' risk factors) and subjective measures of cardiovascular disease (the Rose questionnaire), rather than objective measures (like documented MI). We really have to entertain the possibility that people report more symptoms of chest pain when they feel less in control of their work (causality here may be direct, or via third factors like personality) without necessarily actually having increased rates of CHD - that is they report more chest pain for psychological reasons without necessarily having increased rates of dodgy coronary vessels in the heart. Without an effect on objective coronary endpoints we can only assume that an explanation of this form is most likely. "The large apparent influence of stress on incident angina was probably seen because the people who reported high stress also reported other forms of discomfort in their lives, including chest pain. This was obviously not due to there being any actual stress-related coronary disease, otherwise it would have been revealed in incident ischaemia and cardiovascular disease mortality. We could have published the 2.5-fold increased risk of angina independent of confounders and reporting tendency, because studies of stress have got into major journals reporting on just this outcome with similar effect sizes...Rather than this, we reported these results as demonstrating how it is possible to get misleading findings on stress and disease from observational epidemiology. It is interesting to compare our results...with the Whitehall II study findings for job control...The two studies got very similar results with a subjective measure - Rose angina. In both studies there was no association between job control and the non-subjective measure of electrocardiogram (ECG) ischaemia. There is a remarkable parallelism between the findings." To sum up part 2 - Wilkinson & Pickett rely very much on a psychosocial explanation of how inequality can impact on health and other aspects of quality of life without being mediated via material mechanism such as wealth or healh expenditure. While superficially plausible the basis for this explanation remains, at the very least, unproven. My concern is that if you purely emphasise the psychological impact of inequality then you are choosing to ignore or minimise (and in places W&P explicitly do this) material inequality and will encourage the rejection of more concrete concerns such as addressing smoking behaviour or increasing healthcare expenditure - things which will have a real impact on health and quality of life and which are probably going to be easier to provoke the necessary political will to address directly than tackling the hypothetical ill-effects suffered by people's perception of status inequality. So what is my overall conclusion from reading the book? Well I said when I started out writing these two posts that I avoided reading the book for a long time because I both (a) sympathised with the authors aims and broad policy recommendations and (b) suspected that the actual data and methods used would make me cringe and then rant. I think I was proven right in my (b) but I also think that exposure to the arguments of W&P has undermined my belief in (a) - not that I now think inequality is good but rather that maybe I was wrong about sympathising with W&P's aims, because I wonder whether they are really quite so similar to mine after all. As I concluded at the end of part 1, I don't think the Spirit Level deals with confounding factors at all adequately - and I think this it driven by a desire to undermine any causal role of material factors in explaning the relationship between inequality and health or other societal ills. This leads to W&P making what seem to be arbitrary and suspect looking decisions to exclude countries from their analyses or to use specific data sources rather than others precisely to undermine the relationships between material factors and these important outcomes. They rely heavily on the unproven psychosocial hypothesis to provide a causal underpinning to the associations they describe despite this model being derived from a flawed interpretation of studies such as Whitehall II. I think that there is a real danger that the Spirit Level will lead people who genuinely recognise the social ills caused by inequality in society to neglecting real material changes that could be instituted in the here and now, and encourage politicians to ignore those changes because we all know that it isn't things like relative poverty or lack of access to healthcare that causes these societal problems, it is the psychological trauma of perceiving that you are lower status than someone else. In this regard I think that the Spirit Level may actually have a rather pernicious effect in undermining the very measures that we should be championing to address the inequality we see in our society today. This leads to my concern that perhaps I don't subscribe to (a) above because the authors aims and broad policy recommendations could actually conflict with those I would advocate from a neo-materialist perspective. A worrying further point that I haven't discussed (largely because W&P simply do not provide much evidence to elaborate on it)*6 is that the Spirit Level, particularly in its media guise, has also set itself up for failure - W&P have framed the debate in such a way that they argue that inequality in society leads to worse outcomes for the whole of society, not just those at the bottom of the socioecenomic gradient. Now that may well be true for a number of social ills, but it may also not be for a number of other outcomes. By framing the debate as one of selfishness rather than altruism it provides a get out clause for those better off in society from supporting increased equality if they come to find that inequality is not always disadvantageous for them personally. * The story of the discovery of the relationship between H. pylori and peptic ulcers is rather well know but it is a salutory lesson that spending too much time worrying about stress as a cause for disease can lead us to neglect rather stronger and more easily remedied physical causes. "In the 23 studies addressing association between cortisol in serum or urine and the psychosocial working environment, no consistent results were found: 11 showed no association, nine showed a positive association and three showed a negative association." *** The latest data from the Whitehall II study show that, while those in the lowest employment grade compared to the highest group had 1.6x the death rate, once all health related behaviours (e.g. smoking) were controlled for, and crucially, taking into account how these behaviours varied over the course of the study, there was no statistically significant increase in the overall death rate in the lowest grade compared to the highest. However, overall there was a 1.85x rate of death from CVD in the lowest job grade, but no increased rate of non-CVD mortality. Therefore the main focus of those studying the relationship between inequality and health is on cardiovascular disease, and this has indeed been associated with levels of the 'stress hormone' cortisol as I noted above. In Bosma et al 1997 (from Table 6) odd ratio (OR) of new CHD at follow-up comparing low job control versus high job control: all CHD 1.93 (95% confidence interval 1.34-2.77) and adjusted for coronary risk factors (CRFs) 1.99 (1.36-2.91), angina 2.09 (1.29-3.37) and adjusted for CRFs 2.02 (1.22 to 3.34), diagnosed IHD 1.49 (0.81 to 2.74) and adjusted for CRFs 1.26 (0.67 to 2.39). In Kuper & Marmot 2003 (from Table 2) hazard ratio (HR) of new CHD at follow-up comparing low job control versus high job control (men only): all CHD 1.55 (1.26-1.90) and adjusted for CRFs 1.43 (1.15 to 1.78), fatal CHD and non-fatal MI combined 1.14 (0.82 to 1.59) and adjusted for CRFs 1.01 (0.70 to 1.45). *5 There was also no increased risk of death in these people but since there was no increased risk of death in those diagnosed with CHD by a doctor I don't think this tells us anything. *6 For instance, they don't consider how things like murder rates differentially affect each end of the income distribution, assuming they're just a bad thing for society overall - which may be true but I'm pretty sure you'll find individuals doing rather well out of inequality. Following on from part 1.5, here's my final set of analyses. I've had quite some trouble reproducing the analyses from the Spirit Level. This time I'm going to source my data from somewhere other than the OECD, the UN Human Development Report 2009 - this gives data for income inequality (average Gini 1992-2007), life expectancy at birth (2007), and government health expenditure (2006 in $PPP). I've specified my data set in advance, I'm going to look at all countries (where data is available) shown on Wilkinson & Pickett's (W&P's) figure below which have greater national income than Porugal (the poorest country included in W&P's analyses). I'll also look at all those countries excluding those with a population less than 3 million (a specification made by W&P in their reply to critics). Finally I'll just look at those countries included by W&P in their analyses. Ok, population size, well the lack of data got rid of most of the small ones, but it's bye bye Slovenia with its 2m population, and unsuprisingly it makes little difference to the relastionship with life expectancy not significantly correlating with Gini (r=.12, p>.5) and the relationship with health expenditure even less significant than before (r=.35, p=.08). The two graphs don't look massively different, yet W&P report that they found a statistically significant relationship between income inequality and life expectancy, whereas I didn't find much of a relationship at all. Why would this be? Well, as I've been discussing in the two previous posts the exact composition of countries in the subsample is important, but that can't be the issue here since we've used exactly the same arbitrary sample of countries as W&P. I've also discussed how data source is important, which is why I've sought to do my analyses using different sources to W&P to check how robust they are. But even then the two graphs look pretty similar, and life expectancy estimates are not likely to differ by enormous amounts between sources. ** But one areas where my data in all my analyses differ from those of W&P is in how we estimated inequality. This is important because if you look at the two figures an important differences between them seems to be that Japan in the top left hand corner and the USA, Singapore, and Portugal in the bottom right hand corner seem more extreme in the scatterplot from W&P than they do in my graph. "Other more sophisticated measures include one called the Gini coefficient. It measures inequality across the whole society rather than simply comparing the extremes. If all income went to one person (maximum inequality) and everyone else got nothing, the Gini coefficient would be equal to 1. If income was shared equally and everyone got exactly the same (perfect equality), the Gini would equal 0. The lower its value the more equal a society is. The most common values tend to be between 0.3 and 0.5." "To avoid being accused of picking and choosing our measure, our approach in this book has been to take measures provided by official agencies rather than calculating our own. We use the ratio of the income received by the top to the bottom 20% whenever we are comparing inequality in different countries: it is easy to understand and is one of the measures provided ready-made by the United Nations. When comparing inequality in US states, we use the Gini coefficient: it is the most common measure, it is favoured by economists and it is available from the US Census Bureau. In many academic research papers we and others have used two different inequality measures in order to show that the choice of measures rarely has a significant effect on results." Gosh, if only there was a way to obtain Gini data for the countries they studied. Never mind, since they've told us it doesn't make any difference I'm sure their selection of income ratios rather than the more commonly used and academically accepted Gini coefficient was just for convenience. 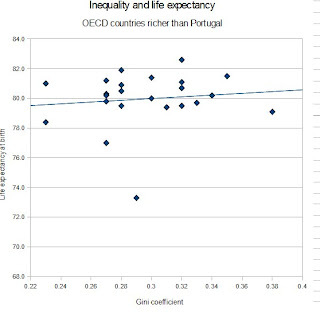 It seems that to both find no relationship between wealth or other markers such as health expenditure and life expectancy, whilst simultaneously finding a relationship between income inequality and life expectancy requires an exquisite balance between exactly which data source, subsample of countries, and measure of inequality you choose to use. Can it really be the case that W&P just stumbled onto this analysis first time and didn't think to check how robust it was to slight variations? Or could it be that there is some intellectual dishonesty at work? ** As Neuroskeptic points out in the comments there is a big difference between the life expectancy data in my graph and in the one from the book. Having downloaded the data from the Equality Trust website it seems that their data is about 3yrs older (from 2004) but from the same source. However, reanalysing the data using the Gini coefficients from this post and the life expectancy data from the book I get a stronger correlation (r=-.34) but this is still not statistically significant (p=.12). Re-analysing the data using their inequality measure confirms their analysis with r=-.44 (p<.05). So my failure to reproduce their analysis is partly about which year the life expectancy data is taken from and partly about the choice of inequality measure. Just a quick update to my previous post: Levelling the Spirit - pt 1 inspired by the discussion with Neuroskeptic in the comments. So I went back to my 2007 OECD data I've been using** and selected just those countries with greater (or equal) national income per capita than Portugal (the poorest country W&P use in their analysis). As you can see from the graph above I still get to keep Hungary, the Czech Republic and Korea, and I'm not including Israel or Singapore because they aren't OECD and that's where I get my data from***. So what is the relationship between inequality and life expectancy in this sample? Well, as you can see from the figure below, essentially there is no relationship (the correlation coefficient is tiny and is not statistically significant). Well presumably this is something to do with range restriction or small sample sizes as we discussed in part 1? 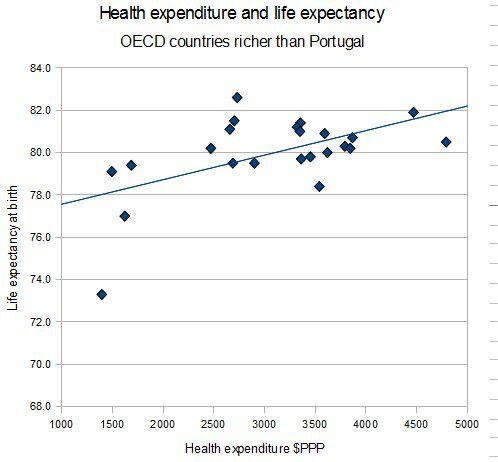 Well maybe not because if we look at the relationship between health expenditure and life expectancy (the data for Portugal are estimated from another source but inclusion or exclusion makes no difference) there is a strong r=.56 statistically significant relationship. If we look at the relationship between Gini inequality and life expectancy when we control for health expenditure the correlation is a statistically significant r=.46, that is higher inequality is associated with greater life expectancy! Now I'm not trying to argue here that inequality really leads to greater life expectancy, or specifically that inequality isn't related to life expectancy, or even that health expenditure is more important than income inequality for life expectancy, although all of these would be conclusions you could draw from the data I've presented. No, what I'm trying to point out is that the choice of both which specific source is used to derive the data and which countries to include or exclude when running these analyses has very important consequences for the relationships that are detected - and I am having trouble seeing what non-arbitrary criteria could be used to select the particular collection of countries used by W&P when it seems so very important to their claims that just this very specific sample are used. * Is it just me that always thinks of this when they hear 'Wilkinson and Pickett'? ** I always exclude Luxembourg even though it is in the OECD because W&P pretty much exclude it from any analysis even though it's rich, and I think most people would agree with them given that it is a tiny (under half a million) country, and also the OECD don't have Gini or health expenditure data for it. *** If this is upsetting you I also derived some 2007 data from another source for Israel and Singapore (from the UN Human Development report 2009) and the findings were the same with these two countries included. When I just looked at those countries used by W&P in their analyses (using OECD data plus the above data for Israel and Singapore) I also found no relationship between Gini and life expectancy (r=-.11, p=.61) which highlights just how important the exact combination of data source and subsample of countries is for W&P's claims. I haven't included UAE, Kuwait, Brunei, Qatar, Bahrain, Barbados, the Bahamas, or Cyprus in any analyses, just as W&P haven't, although they are richer than Portugal on that curve. I listened to an episode of Radio 4's Analysis programme about the ubiquitous book 'The Spirit Level' today (it has also been covered on More and Less). I resisted reading the book for a long time because I both (a) sympathised with the authors aims and broad policy recommendations and (b) suspected that the actual data and methods used would make me cringe and then rant. So in order to fulfil the 'rant' part of that reaction I'm going to share my thoughts on the evidence behind the Spirit Level in two parts trying not to associate myself with some of the attacks on the book from the right (but note that criticism hasn't come only from the right). 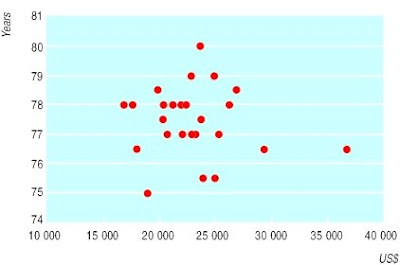 I'll start with a discussion of the scatter plots that form the core of the book. Now I'm just not a fan of 'ecological' analyses at the level of countries - even if you do multivariate analyses trying to control for confounding variables you're still taking a dozen heterogeneous societies and drawing straight lines through the data in a simplistic fashion. But in this book the authors, Richard Wilkinson and Kate Pickett, aren't even doing that, they're just plotting bivariate scattergrams, which doesn't bring the level of the analysis much above the level of a blog post (and I should know, I've written just such posts). What the authors do is basically print a large number of scatter plots which show a relationship between 'inequality' (largely represented as income inequality) and something bad (e.g. murder rates, overall mortality, subway sandwich bars per capita, etc*) - they promise that the scientific literature shows that any potential confounding factors don't matter. So just how robust are the correlations in the Spirit Level? 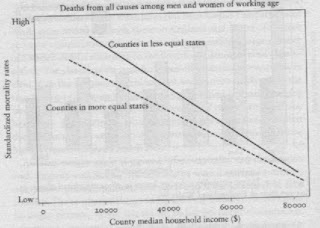 Well lets look at one of them - the book makes considerable hay with the relationship between (income) inequality and worse life expectancy so that is what I will focus on (see Figure 1 below). 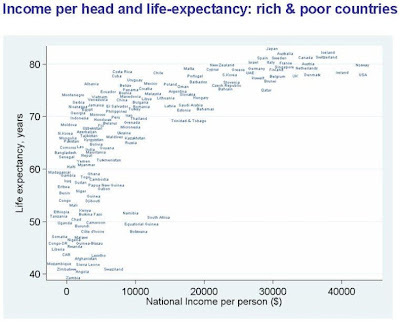 It seems that the worse the income inequality in a country the lower the life expectancy. 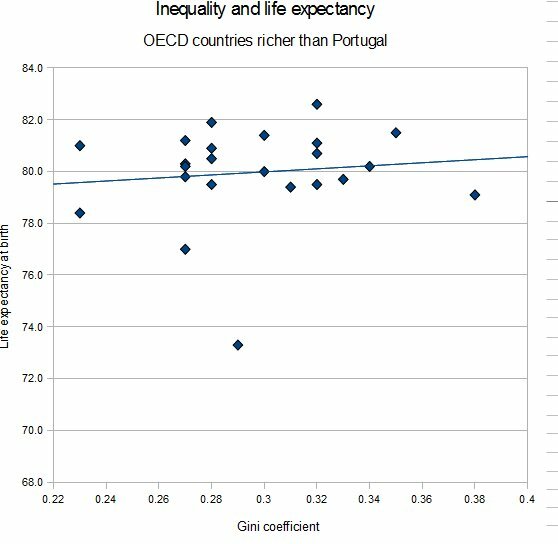 So what is causing this relationship between income inequality and life expectancy? Wilkinson & Pickett would say that it is psychosocial factors (such as chronic stress caused by the status anxiety of an unequal society - more on this in part 2) but we can't really reach the conclusion that it is inequality per se causing the lower life expectancy without considering some alternative explanations - that is, we need to ask what other factors are correlated with both inequality and life expectancy that might actually causally mediate the relationship and show that they don't, in fact, do this. 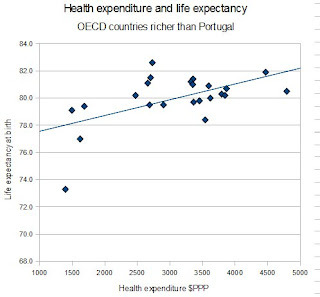 I've previously talked about the relationship between health expenditure and health outcomes including life expectancy (in these five posts here) and this would represent a good first proxy for those material factors that could underlie this relationship. Wilkinson & Pickett (W&P) say that health expenditure cannot be the causal factor, and produce this little graph to illustrate why (see Figure 3 below). In this scatterplot they find no relationship between the expenditure on health in these developed countries and life expectancy. Could this really be true? The US could reduce its expenditure from nearly $6000 per person down to the Portugese level of nearly $2000 and have no effect on life expectancy? That is quite a bold claim to be making with really very far reaching potential consequences if it is true. Strangely I seem to get quite a strong relationship between health expenditure and life expectancy, the correlation is .56 (that is, the more money spent the longer the life expectancy). 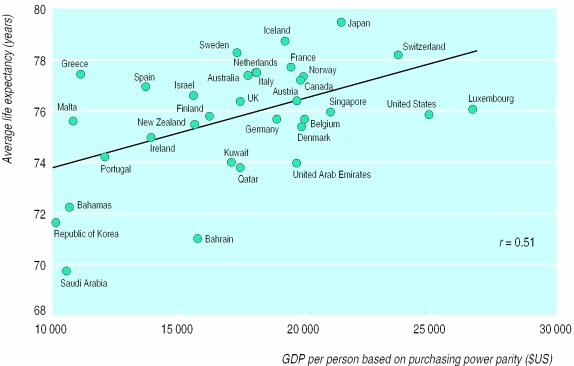 In addition the correlation between Gini and expenditure is -.30 - so it might be plausible that rather than being mediated via psychosocial stresses maybe more unequal societies just don't spend as much on healthcare which leads to material deficits in the healthcare for that country - is it the case? Choosing your sample - or picking those cherries? "All the data come from the most reputable sources - from the World Bank, the World Health Organization, the United Nations and the Organization for Economic Cooperation and Development (OECD), and others." "In The Spirit Level analysis the authors took countries among the 50 richest in the world with populations of more than 3 million, for which there was comparable income distribution data. They did this because they wanted to look at the countries where life expectancy and other outcomes have ceased to be related to economic growth. Peter Saunders adds in Chile, Argentina, Mexico, Venezuela, Turkey, Trinidad & Tobago, Malaysia, Russia, Estonia, Lithuania, Latvia, Poland, S. Korea, Romania, Slovenia, Hungary, Croatia, Czech Republic, Slovakia. 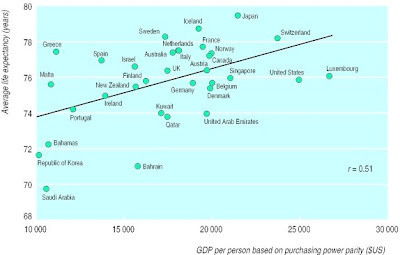 In Figure 1.1 (in The Spirit Level ) it can be seen that all these countries are on the rising part of the curve indicating that for them, unlike the richest countries, economic growth remains beneficial. Saunders' later demonstration that economic growth remains beneficial is entirely a result of including these poorer countries." Even by W&P's standards if we look at countries by PPP adjusted GDP or by nominal GDP per capita they should have included countries like Hungary, the Czech Republic, Slovakia, Poland or Croatia which all come in the top 50 and have populations over 3 million. I took my data (without trying to decide on countries a priori) by just looking up what OECD data was available, and using that directly including where the numbers were indicated to be estimates (since we're interested in trends not exact numbers here). 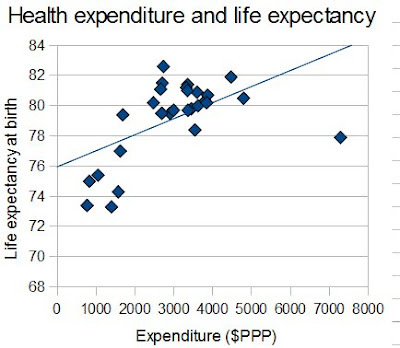 I'm somewhat concerned as to what exact grounds W&P have used to justify excluding those countries which fall at the bottom left of the scatterplot and thus will contribute most to the correlation between wealth (or health expenditure, or whatever measure of material difference we're using) and life expectancy. At this point I think we need to talk about range restriction. If there is a correlation between two variables (say, for example, height and weight) then, despite the scatter (since not every heavy person is tall, and not every tall person is heavy, it is a relationship that holds on average) there will be a correlation and you can draw a nice regression line showing the relationship - but what happens if you just look at one part of the range (say only those above average in height)? well the relationship (as measured by the correlation) gets smaller, because the scatter noise now begins to mask the relationship. If you keep restricting the range eventually you'll end up with no relationship at all (say looking only at those in the top 10% of heights) even though we know that there is a relationship when we consider the whole range (have a look here for a visual example). What this digression means is that you have to be careful about insisting on only looking at rich countries because you may not be showing that there is no relationship between expenditure and health in those countries, you may simply have restricted the range so much the relationship gets lost in the noise. And a good sense check for that is to see what happens when you add in a few countries at the bottom of the range - if there really is not relationship it shouldn't make much difference, and if it does you might want to think about just why you're excluding them - a point that is think is highly relevant if you're thinking about keeping in, say, Portugal (population 11m, nominal GDP per capita $22k) but excluding, say, the Czech Republic (population 10m, nominal GDP per capita $18k). Looking at W&P's argument above you also have to be very careful you don't begin some circular reasoning ("these countries are on the rising part of the curve...economic growth remains beneficial") where the very fact that a country has low health expenditure and low life expectancy, so that if it is included in the analysis there will be a relationship, it therefore must be excluded from the analysis - i.e. if there is a relationship we'll eliminate these countries until there is no longer a relationship! (see part 1.5 for further discussion of just how important the specific selection of countries by W&P is for their claims). 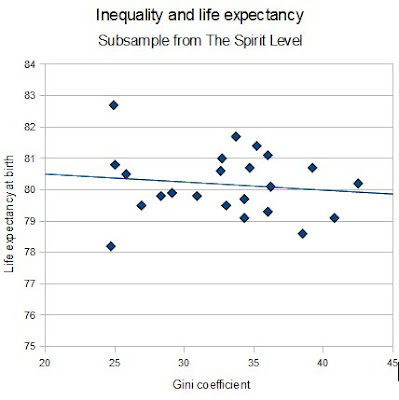 So, I think my take home message from part 1 is that the Spirit Level doesn't deal with potentially confounding factors in a satisfactory way, ignoring or dismissing material differences between high and low equality countries that could be the actual causal mechanism for the relationship between inequality and life expectancy (or other measures). *8 It also contains some fairly arbitrary and suspect looking decisions to exclude various countries that upset the arguments W&P are making. It is probably worth noting that these shortcomings are not accidental - Wilkinson has been working in this field, and making these sorts of arguments, for many years and others have been questioning the assumptions he makes for just as long. 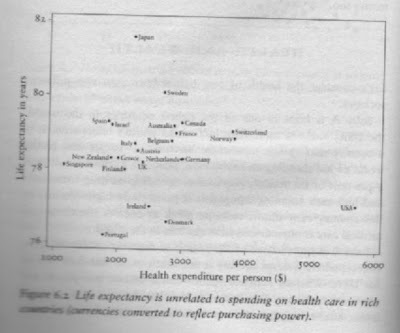 The figure shows the relation between life expectancy and gross national product per capita at purchasing power parities for the 25 richest countries for which the World Health Organization holds 1998 data. There is a slight negative relation between the two (r=−0.107). For the 30 richest countries, the correlation is 0.064. It is only when poorer countries are included that the association with mean income emerges. 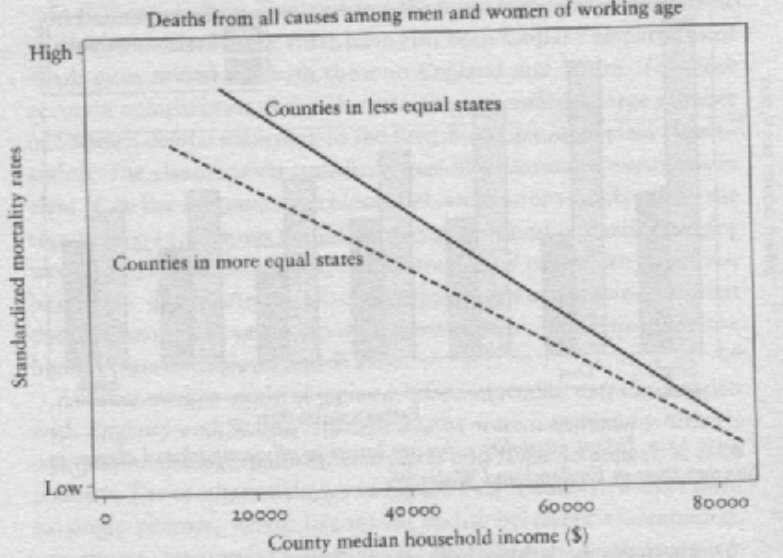 Wilkinson's demonstration that absolute income was unrelated (r=0.08) to health among developed countries has been important in staking a claim for this psychosocial theory of health inequalities. Figures...show the association between gross domestic product per person and life expectancy...for the 33 countries where gross domestic product was greater than $10000—the cut-off used by Wilkinson. Our results, however, include data for all the countries above $10000, not a selection of some countries in the Organisation for Economic Cooperation and Development as used by Wilkinson. The correlation between life expectancy and gross domestic product per person in the complete sample is r=0.51 (P=0.003). Thus the association between absolute income and life expectancy among wealthier countries depends on which countries are included. This is an argument that started a long time ago, the points being made now by the critics of W&P are not new, while I'm sure we're not going to resolve this debate any time soon it would be grossly misleading to pretend that these criticisms are purely politically motivated. Many researchers in this field were unimpressed when Wilkinson first made these arguments and those objections still stand largely unanswered. I think that's enough for today - in part 2 we'll discuss the evidence for those psychosocial mechanisms W&P postulate to provide the causal connection between inequality and health (and various other 'bad things'). If yiou just can't wait until then 'Levelling the spirit - pt 1.5' should tide you over. * I may have made up one or more of these examples. ** I'm going to use OECD data on OECD countries as my sample - the Spirit Level uses a lot of data from them and they largely represent what people would consider developed high income countries, I'm using 2007 which is the most complete set of data I have available. I've included all OECD countries I could get data for directly from the OECD so I don't include Chile because there was no Gini data or Luxembourg and Portugal because there was no health expenditure data, the US and Korea lack infant mortality data but are included in the life expectancy analysis. *** All correlations are statistically significant at least to p<.05 unless I specifically note otherwise. *4 This means that instead of adjusting expenditure between countries by the exchange rate between their currencies you look at what that expenditure would actually buy within the country concerned (so in a poor country your dollar is likely to go a lot further than in the US, and the purchasing power parity equivalent conversion reflects this). This seems to be the same thing that they do in the Spirit Level (see, I don't just make this stuff up). *5 Note that if you partial out Gini from the relationship between expenditure and life expectancy you still see a partial correlation of .50 - more expenditure means longer life expectancy. *6 This is a similar finding to that made in this person's blog post except, for some reason (perhaps selection of source for Gini coefficients) they don't find a significant relationship between Gini and life expectancy (whereas I do) but they do find the reversal of this relationship if you include covariates (in their analysis per capita GDP). What W&P want to do is compare the steepness of the slope indicating the relationship between income and mortality between those counties from the 25 most equal states and the 25 least equal states. That more equal states have a less steep relationship between income and mortality doesn't concern us here, what is interesting is that there is a relationship between income and mortality at the county level within the US at all - this is contrary to what W&P are arguing at the level of individual nations where they dismiss a relationship between national income (or health expenditure) and life expectancy (or other health outcomes) and you have to wonder why this relationship would hold within a rich country but not between them. *8 Looking at infant mortality, another measure often used to estimate a country's level of health, we find that there is a correlation between the Gini coefficient and infant mortality of .77. Health expenditure correlates with infant mortality with a coefficient of -.64. 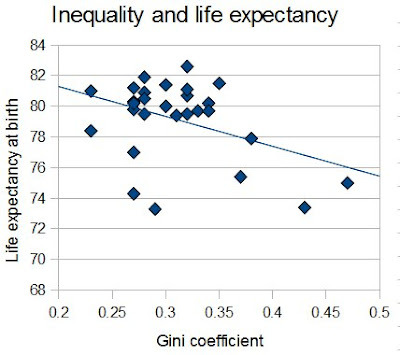 However, unlike with the relationship between Gini and life expectancy, the partial correlation between Gini and infant mortality, controlling for health expenditure, the coefficient is attenuated to .62 - that is the relationship between income inequality and infant mortality is not likey to be mediated purely through the relationship between health spending and infant mortality - so it is more complicated than just claiming that the relationship between inequality and any health measure is simply mediated by health spending.